In my opinion, the entryway is one of the most important rooms in a house. Think about it. It's the first room that your guests see when they walk into your home. And if you're like me, it's the area where you "decompress" each time you walk in the front door. And by decompress, I mean kick off my shoes, throw down my bag , drop off the mail.... basically, toss my junk everywhere! So when Christie emailed me about designing her entryway, I knew that the room needed to be pretty, inviting and functional. Kind of a tall order for one space! 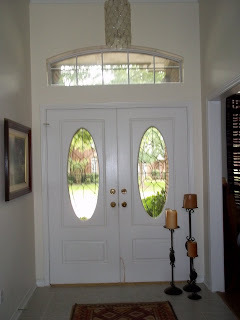 Christie lives in a beautiful home with a large entryway area. Annnnd, get this- she told me she was all for DIY projects!! An e-design dream come true for me! Wanna see what I came up with? Here are a couple of my favorite sources for the design. 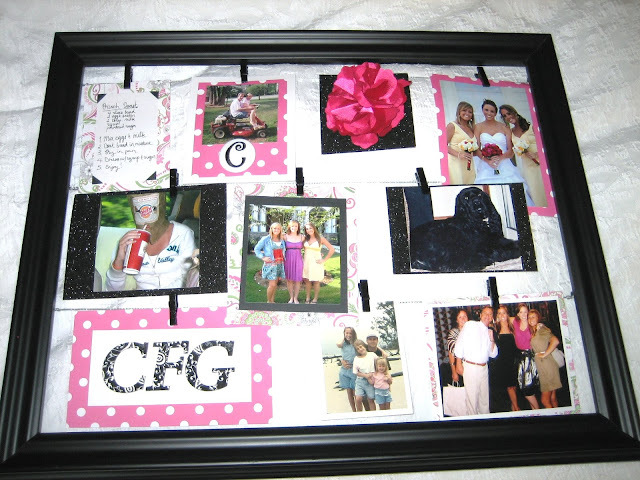 Clothespin picture frame- this frame is perfect for an entryway because you can switch out the contents. Cute new Polaroid of your kiddos? Check. Birthday postcard from Grandma? Perfect. Notes for the hubs? Clip it to the frame! You can whip one of these up pretty easily by using this tutorial I shared back in the beginning days of my blog. Here's the version I made for my sister. Baskets- Looking for functional and chic? These Pier 1 baskets are perfect for the entryway space. 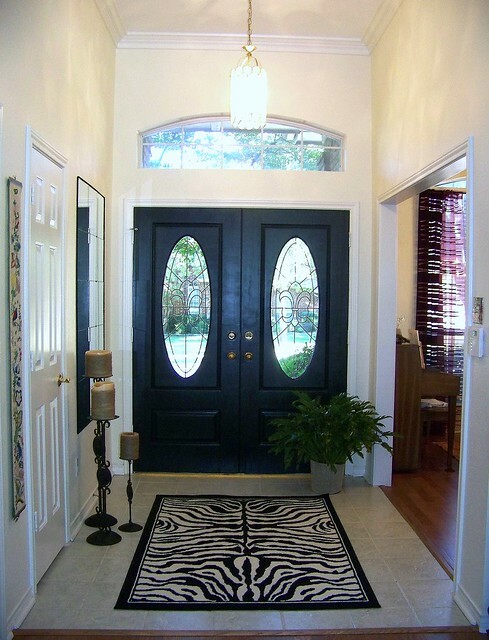 Black painted door- In order to bring some presence to the space, I also suggested that Christie paint her entry doors black. One of my favorite neutral-to-black-entry-door transformations is Cassie's, which you can see here. It's such a powerful (inexpensive!) idea. Are you interested in a Ten June E-Design? 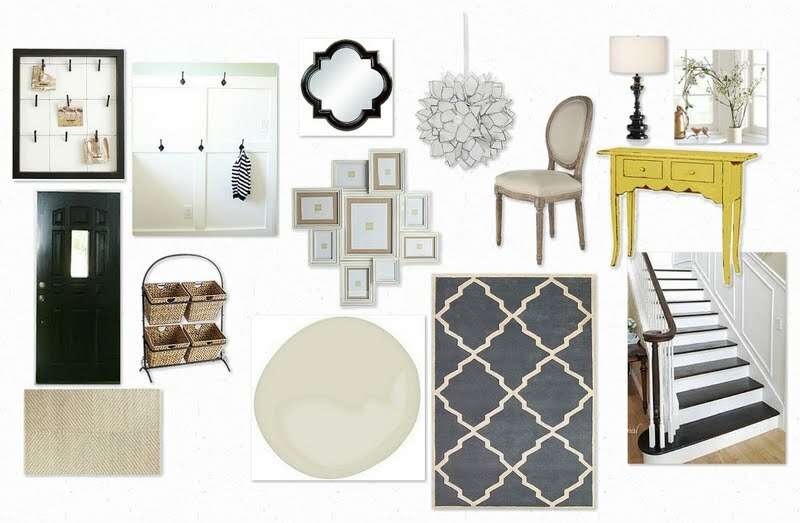 If you need help designing a room or even just getting started with design ideas in your home, I'd love to help! Check out my E-Design page or shoot me an email at tenjuneblog@gmail.com! Make sure you stop by Courtney's today as she continues her fabulous "Take Five" series! And I'm also over Shelli's today too! Come say hi! love the design!! that pop of yellow in the table is awesome! Nicely done my friend. I am a huge fan of painting the door. Great entryway! wow i love this design!!! you are amazing! Another great redo - it really pops and says, "wow"
and you e-design offer is great for readers. Hope she shares her pics! What a great plan! I love the look of a painted interior door! I love love love this entry design. I was totally thinking about painting the interior of our door black and you just put me over the edge. Thanks for the inspiration! I love the design board you made for her! It looks awesome! I think the yellow table will still the show! Love how you paired it with the gray rug and black (fun shaped) mirror! Great design! i love that black painted door! I love your design for her entry! Love the pop of color with the table. Thanks for sharing! Check us out! Thanks for letting me know about this design board! I love your ideas - and that is exactly how I want my stairs to look. Except I will have to add some kind of runner since my husband will insist on that part. I like the idea of painting the door black too. The outside of the door is already black so I think it would look great! Thanks for the ideas and have a nice weekend!